Andrey graduated from Finance Academy (now a university) under the Government of Russian Federation with honours. After that Andrey worked as an Assistant Manager in the Transaction Services Department at PriceWaterhouseCoopers in Russia and Germany for 3 years. 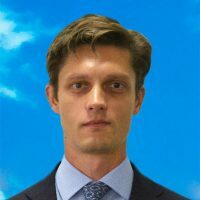 In 2007 Andrey joined the team of the investing consultant of Elbrus Capital. In 2013 Andrey became a CEO of a telecommunication consulting company. In May 2018 Andrey was appointed General Director of OSG Russia.